For the 2012 Italian film, see Tulpa (film). Tulpa is a concept in mysticism and the paranormal of a being or object which is created through spiritual or mental powers. It was adapted by 20th century theosophists from Tibetan sprul-pa (Tibetan: སྤྲུལ་པ་, Wylie: sprulpa) which means "emanation" or "manifestation". Modern practitioners use the term to refer to a type of willed imaginary friend which practitioners consider to be sentient and relatively autonomous. Emanation bodies—nirmanakaya, sprulsku, sprul-pa and so on—are connected to trikaya, the Buddhist doctrine of the three bodies of the Buddha. They are usually emanation bodies of celestial beings, though "unrealized beings" such as humans may have their own emanation bodies or even be emanation bodies. For example, the 14th Dalai Lama is considered by some followers to be an emanation-reincarnation or tulku of Chenrezig, the Bodhisattva of Compassion. The 14th Dalai Lama mentioned in a public statement that his successor might appear via emanation while the current Dalai Lama is still alive. The Western occult understanding of the concept of "thoughtform" is believed by some to have originated as an interpretation of the Tibetan concept of "tulpa". The concept is related to the Western philosophy and practice of magic. [page needed] Occultist William Walker Atkinson in his book The Human Aura described thought-forms as simple ethereal objects emanating from the auras surrounding people, generating from their thoughts and feelings. He further elaborated in Clairvoyance and Occult Powers how experienced practitioners of the occult can produce thoughtforms from their auras that serve as astral projections which may or may not look like the person who is projecting them, or as illusions that can only be seen by those with "awakened astral senses". The theosophist Annie Besant, in her book Thought-forms, divides them into three classes: forms in the shape of the person who creates them, forms that resemble objects or people and may become "ensouled" by "nature spirits" or by the dead, and forms that represent "inherent qualities" from the astral or mental planes, such as emotions. The concept of tulpa was popularized and secularized in the Western world through fiction, gaining popularity on television in the late 1990s and 2000s. In 2009, anonymous posters on the discussion board 4chan started experimenting with creating tulpas, and the community gained popularity through the emergence of the My Little Pony: Friendship Is Magic fandom. The fans attempted to use meditation and lucid dreaming techniques to create imaginary friends. Surveys by Veissière explored this community's demographic, social, and psychological profiles. These individuals, calling themselves "tulpamancers", treat the tulpas as a "real or somewhat-real person". The number of active participants in these online communities is in the low hundreds, and few meetings in person have taken place. They belong to "primarily urban, middle class, Euro-American adolescent and young adult demographics" and they "cite loneliness and social anxiety as an incentive to pick up the practice." 93.7% of respondents expressed that their involvement with the creation of tulpas has "made their condition better", and led to new unusual sensory experiences. Some practitioners have sexual and romantic interactions with their tulpas, though the practice is controversial and trending towards taboo. One survey found that 8.5% support a metaphysical explanation of tulpas, 76.5% support a neurological or psychological explanation, and 14% "other" explanations. ^ a b c Campbell, Eileen; Brennan, J.H; Holt-Underwood, Fran (1994). "Thoughtform". Body, Mind & Spirit: A Dictionary of New Age Ideas, People, Places, and Terms (Revised ed.). Boston: C.E. Tuttle Company. ISBN 080483010X. ^ a b Mikles, Natasha L.; Laycock, Joseph P. (6 August 2015). "Tracking the Tulpa: Exploring the "Tibetan" Origins of a Contemporary Paranormal Idea". Nova Religio: The Journal of Alternative and Emergent Religions. 19 (1): 87–97. doi:10.1525/nr.2015.19.1.87. ^ a b c d Joffe, Ben (13 February 2016). "Paranormalizing the Popular through the Tibetan Tulpa: Or what the next Dalai Lama, the X Files and Affect Theory (might) have in common". Savage Minds. Archived from the original on 14 July 2017. Retrieved 22 April 2017. ^ a b c d Fiordallis, David (20 September 2008). "Miracles and Superhuman Powers in South Asian Buddhist Literature" (PDF). University of Michigan. Archived (PDF) from the original on 23 April 2017. Retrieved 22 April 2017. ^ Evans-Wentz, W.T. (2000). The Tibetan Book of the Dead: Or The After-Death Experiences on the Bardo Plane, according to Lāma Kazi Dawa-Samdup's English Rendering. New York: Oxford University Press. pp. 29–32, 103, 123, 125. ISBN 0198030517. ^ Rinpoche, Dza Patrul (1996). The Golden Letters: The Three Statements of Garab Dorje, the First Teacher of Dzogchen (1st ed.). Ithaca, New York: Snow Lion Publications. p. 350. ISBN 9781559390507. ^ a b c d David-Neel, Alexandra; DʼArsonval, A. (2000). Magic and Mystery in Tibet. Escondido, California: Book Tree. ISBN 1585090972. ^ Marshall, Richard; Davis, Monte; Moolman, Valerie; Zappler, George (1982). Mysteries of the Unexplained (Reprint ed.). Pleasantville, NewYork: Reader's Digest Association. p. 176. ISBN 0895771462. ^ Cunningham, David Michael; Ellwood, Taylor; Wagener, Amanda R. (2003). Creating Magickal Entities: A Complete Guide to Entity Creation (1st ed.). Perrysburg, Ohio: Egregore Publishing. ISBN 9781932517446. ^ Panchadsi, Swami (1912). "Thought Form". 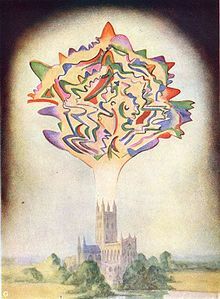 The Human Aura: Astral Colors and Thought Forms. Yoga Publication Society. pp. 47–54. Archived from the original on 3 October 2016. Retrieved 26 April 2017. ^ Panchadsi, Swami (1916). "Strange astral phenomena". Clairvoyance and Occult Powers. Archived from the original on 26 June 2009. Retrieved 26 April 2017. ^ Besant, Annie; Leadbeater, C. W. (1901). "Three classes of thought-forms". Thought-Forms. The Theosophical Publishing House. Archived from the original on 10 December 2016. Retrieved 26 April 2017. ^ Thompson, Nathan (2014-09-03). "Meet the 'Tulpamancers': The Internet's Newest Subculture Is Incredibly Weird". VICE. Archived from the original on 2016-12-15. Retrieved 2017-04-22. ^ T. M. Luhrmbann (2013-10-14). "Conjuring Up Our Own Gods". The New York Times. Archived from the original on 2017-08-12. Retrieved 2017-04-22. Look up tulpa or Thoughtform in Wiktionary, the free dictionary.